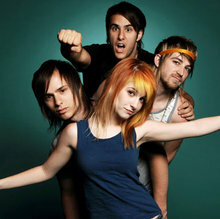 Paramore is an American rock trio from Franklin, Tennessee, formed in 2004. The band currently consists of lead vocalist Hayley Williams, bassist Jeremy Davis, and guitarist Taylor York. 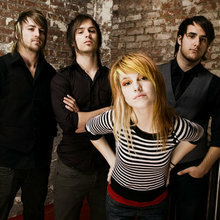 The group released its debut album All We Know Is Falling in 2005, and its second album Riot! in 2007, which was certified Platinum in the US and Ireland and Gold in Australia, Canada, New Zealand, and the UK. Brand New Eyes, Paramore's third album, was released in 2009 and is the band's second-highest charting album to date, going platinum in Ireland and the UK, and gold in the US, Canada, Australia and New Zealand. Paramore's 2013 self-titled fourth album debuted at No. 1 on the Billboard charts in the United States. It was also the No. 1 album in the United Kingdom, Ireland, Australia, New Zealand, Brazil, Argentina and Mexico.